The Bucas Buzz-Off Rain Zebra Full Neck Fly Rug is an innovative summer rug with a waterproof top section and mesh sides, making it perfect for changeable summer weather. The upper section has a sun reflective colour to help protect against overheating with a mesh lining to help maintain air circulation. The mesh sides have zebra print to offer the same protection from flies as the Buzz-Off Zebra - research has discovered that flies hate the Zebra stripes as they find it confusing and so steer clear of them! The weaterproof and breathable upper extends up the integrated neck cover to help protect your horse from showers. 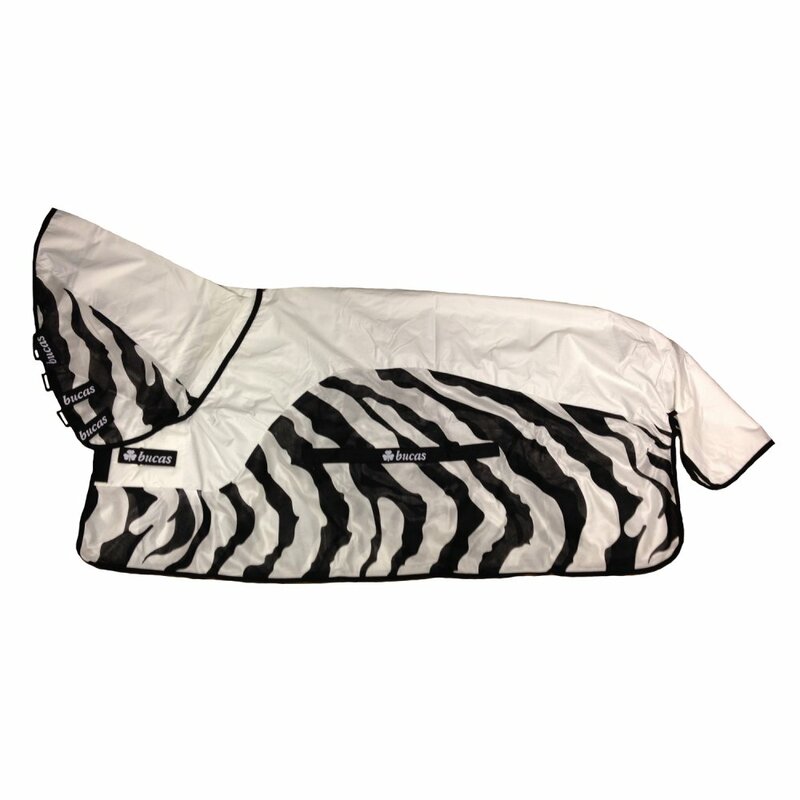 The Bucas Buzz-Off Rain Zebra Rug has a belly pad to ensure the rug is kept in place, as well as protecting the belly of the horse from flies. A matching Zebra Fly Mask is available seperately to protect the eyes and ears of the horse as required. The tail flap on this rug offers protection for the tail and the overlapping padded front ensures comfort for the horse. The neck line of the rug features small darts to ensure the rug has plenty of room at the shoulders.